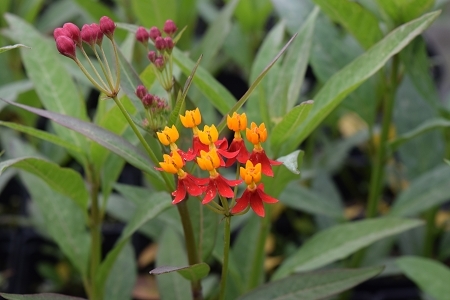 Silky Red Milkweed (asclepias curassavica 'silky red') - Also called Mexican Milkweed, Tropical Milkweed, or Bloodflower. Blooms are dark red with yellow centers. Important monarch butterfly plant. Easy to grow perennial zones 8-11. Milkweed are poisonous if ingested. Live plant in 3 inch pot.